Witty father of the babies. He's a proven 100% Triple Het. Male. He's Het for Wit, Hypo and Trans, in shed in the pictures.. Bloodlines are Father Nitwit a Full Wit male purchased from Josh D. x Sky a Hypo Trans female, paradox runs in her lines as well as German Giant. She was produced here at Rainbow Bearded Dragons 8 years back, not from Wit lines. Tabby Mother of the babies. A Triple het, 100% Het for Wit,100% Het Hypo and 100% het for Trans, PROVEN. 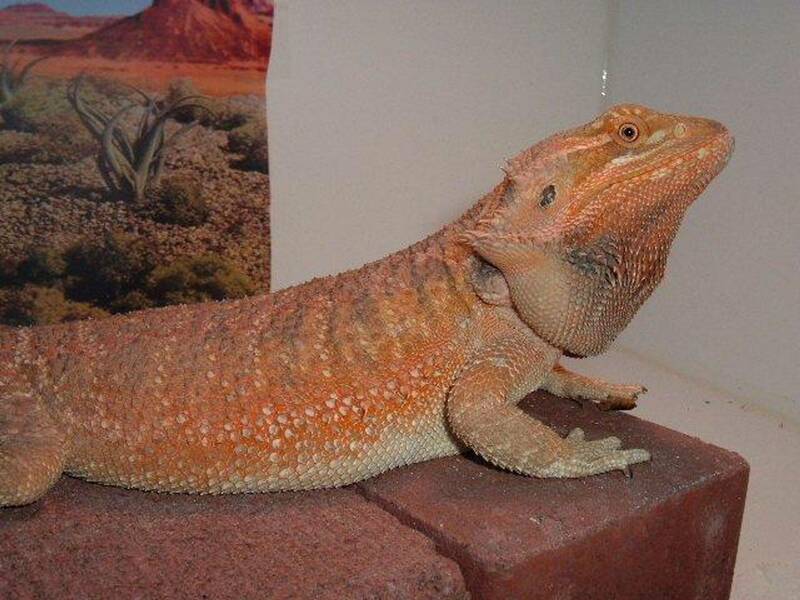 She's in shed in the pictures and just laid eggs that day as well.Still a great looking girl. Thes 5 and 6 week old babies are doing great. They have been started on Mustard greens with grated yellow summer squash all mixed together and are eating 1/4 to 3/8 inch size crickets.These have a 66% Chance of being het for Wit, hypo and Trans if not visuals. Paradox also runs in the lines.Most of these are Breeder Quality as well. This beautiful Hypo Female is #W1 She's 6 weeks old and 7 inches long.She will be a good size girl with good care, Breeder Quality and 66% chance het for Wits and Trans. She's very easy to handle as well. Sale price is 165.00 plus 45.00 for shipping! This pretty Hypo Female is #W6 She's 6 weeks old and 6 inches long. Color will increase with additional sheds. She's tame, very easy to handle and has a 66% chance of being het for Wits and trans. Sale price is 165.00 plus 45.00 for shipping! This Hypo Trans Male is #W9 He's 6 weeks old and 6.5 inches long.He's very sweet and easy to handle. Would make a great pet or future breeder.He has a 66% chance of being het for Wits and will get more color in with additional sheds. Sale price is 175.00 plus 45.00 for shipping! This Cute Trans Male is #W11 He's 6 weeks old and almost 6.5 inches long. He's very sweet and easy to handle and has a 66% chance of being het for Hypo and Wits. Sale price is 165.00 plus 45.00 for shipping! To Inquire about one of my dragons. Just click on link to send an e-mail .I will need the number on the dragon you would like to get in the e-mail and your zip code. Must be at least 18 years of age to inquire about the dragons. When purchasing you agree to our Terms of Service on the Terms of service page . All forms of payment are accepted, including credit cards. I'm a Night Owl so late inquiries are welcomed THANKS. If you plan on Buying a dragon from me PLEASE READ THE CARING FOR YOUR NEW DRAGON PAGE ON MY WEB SITE. It will go over how these need to be housed ,very important.